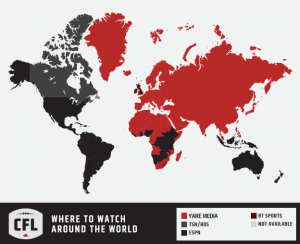 June 29, 2017 Vancouver, BC – Yare Media Group Inc. announced today the successful launch of the Canadian Football League (CFL) 2017 online video service to fans in over 130 countries. The service includes delivery of 81 regular season games, playoff action and the 105th Grey Cup presented by Shaw. Fans from around the world visited the site on opening weekend. The highest level of international subscription purchases came from Germany, followed by Japan and Italy. Countries generating the highest levels of traffic were Iraq, Algeria, Egypt, Tunisia and Bangladesh. Season, team and game purchases were also processed for CFL fans in Egypt, Switzerland, Netherlands, Taiwan, Sweden, Hong Kong, Austria, United Arab Emirates, Estonia, Kuwait, Denmark, Qatar, Romania, South Africa, Serbia, South Korea, Israel and China. Nearly half of all purchases (48%) were for the entire season package. Sixteen percent of fans elected to follow their favourite team while 36% purchased single game packages. The service is offered in a responsively designed interface specifically designed for easy navigation on handsets. The platform also operates on PCs and tablets using HTML5 video technology to deliver HD content in adaptive bitrates, automatically providing users with the optimal resolution for their devices based on their local internet connectivity. International fans with broadband connections can use Chromecast and Airplay technologies to display games on their large screen TVs. The site is at http://www.intl.cfl.ca. With staff in Vancouver, Toronto, and Austria, Yare Media helps media properties develop global revenue streams. Yare addresses changing content distribution models in sports, broadcasting and entertainment. The company focuses on helping media properties to implement market strategies that generate new over-the-top (OTT) digital revenues and help grow their audience and brand. Yare offers enabling platforms, transcoding, transaction processing, content delivery services, syndication and casting technologies for organizations wanting to deliver high quality video experiences. Clients include: Rogers Sportsnet, Magnabet, ORF, Turtle Entertainment, SAT1, Nintendo, Austria Press Agentur, Canada West University Athletics Association, the United Nations, and Microgaming. The website is at www.yaremedia.com.